You've probably never heard of a company called 2GIG Technologies, but they are really starting to make a name for themselves in the network-accessible home security system arena. 2GIG has developed what we consider to be the iPhone of home security systems. The Go! 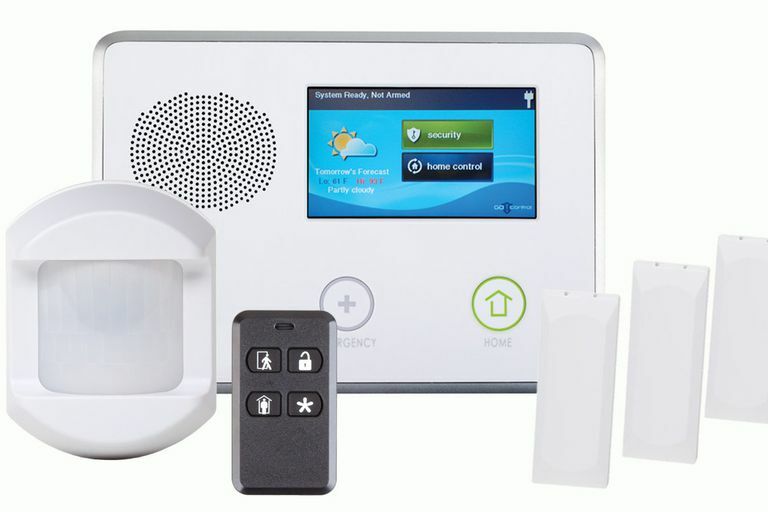 Control panel is one of the most intuitive, feature-packed, well-designed home security systems that we have ever dealt with. After a break-in we had last year, we were on the hunt for a security system that we could install ourselves. We had previously had an "old school" system and was not impressed with the unit or the service provider. This time around we thought we would get our DiY on and install one ourselves. We looked at several of the systems currently on the market but they didn't seem very DiY-friendly, requiring the installer to enter a lot of archaic codes for setting the main unit up and registering the sensors. We were becoming frustrated in our search until we stumbled upon the 2GIG Go! Control wireless security system. It immediately caught our eye because it didn't have a standard numeric keypad, but had a bright LCD touchscreen instead. Everything sounded great, the only thing we were worried about was how much was this thing going to cost. Much to our surprise, we found it for $460 at the Home Security Store. This site caters to do-it-yourselfers who want professional-grade alarm systems but don't want to pay crazy high installation prices or get locked into multi-year service contracts. The basic kit comes with 3 wireless door/window contact sensors, a motion sensor, a key fob for arming and disarming the system, the main control panel itself, a power adapter and battery, and a cellular card that installs into the control panel. You must choose which cell-provider you prefer when purchasing the unit which determines what type of cell radio is installed. We recommend choosing the provider that you know has the best signal reception at your house. Your alarm cell service cost is built into your monthly alarm service fee depending on which provider and service package you choose. The documentation provided by 2GIG (and many other alarm systems) are geared towards professional installers, but we were still able to understand everything that was needed to get things running. The only issue we had was that the system didn't include a user manual and had only an install guide, This was remedied by visiting their website and downloading the user guide. One other problem was that no power cable is included with the system. Again, we guess they figure that professional installers will have a spool of cable with them that they will cut to the proper length required. It still would have been nice if they would have included a 10-foot length of cable so that they might have saved me a trip to my local Radio Shack. The install itself took a couple of hours and was fairly straightforward. Registering the wireless sensors was very easy. We waited for a few days before we chose a service provider. We opted for the security service that was advertised on The Home Security Store's website which was an alarm relay service powered by Alarm.com. We opted for the advanced interactive service that permitted remote arming / disarming via our iPhone and also provided some advanced notification features that allow us to be alerted via text /e-mail/push notifications when the alarm is tripped or when certain sensors that we choose are triggered. For instance, every time our driveway gate is opened during regular work hours we get a text stating that it was open. It doesn't set the alarm off or call the police (although we could have it do that). It just notifies us that someone is messing with the gate. The alarm service which is powered by Alarm.com can also integrate with our DiY Wireless Security Camera System (for a fee) allowing us to see the video of alarm-related events (if we opt to pay the extra cost). The touchscreen experience is much more intuitive than the old school keypads offered by other security system providers. In addition to the touchscreen, the system also features a large fire/emergency buttons in the event that you are too panicked to fiddle with the touchscreen. It also features a home button that takes you back to the main menu similar to the home button on an iPhone. The system features voice responses for just about every event, such as opening a door. You can build your own custom voice responses by stringing together words found in the built-in word bank. For example, we have a back door and a backyard door and we were able to name them appropriately since all of those words were available from the built-in voice bank. The voice bank is somewhat limited though as we were not able to find the word "gate" and had to substitute another word in its place. We have had absolutely no problems with this system so far and are eager to enable some of the advanced features such as the z-wave lighting, thermostat, and door lock control. The system is highly expandable. You can easily add other sensors such as smoke/fire and glass break sensors at any time by simply purchasing the sensors and following the enrollment process. We added a second key fob and a couple of extra door contacts. If your looking to increase your perimeter security for your home or business you should definitely take a look at the 2GIG Go! Control Wireless Home Security System.